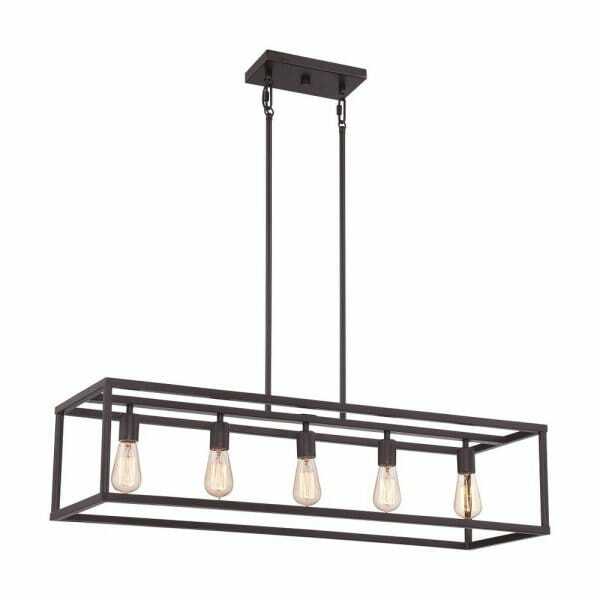 Rectangle pendant light 'New Harbor Island' perfect for above tables and kitchen islands. The open framework on a vintage bronze effect is simple and effective. The open airy slightly industrial feel of this light works very well with vintage style bulbs (optional extra) shown in the image but, any Edison screw bulbs may be used too. We like the practicality of the light as there is no glass, there's no cleaning, utterly practical for kitchen and homes where there maybe a risk of damage from over excited kids of any age!! This light may also be used in restaurants, bars, coffee shops to name a few. Looks equally good in rustic traditional setting and modern settings. Other Features: Supplied with 4 x 300mm & 4 x 150mm rods.